Show off beautiful plants no matter what the limits of your home environment! Expert Michael Sarowsky from the Master Gardener's Association talks about gardening in containers and in sandy soil. 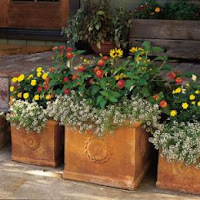 Container gardening is great for people with limited space. Discover how to get the most out of window boxes or how to decorate decks with plants in distinctive containers of all shapes and sizes. Or, if sandy soil is a problem in your Cape Cod backyard, learn techniques for improving soil. Come with all of your questions - Michael is ready to respond! Pretty soon your little place on Earth will be the prettiest little place on Earth, attracting the attention of the whole neighborhood.